Doha, Qatar, June 14, 2015: Qatar has witnessed unprecedented and sustained growth over the past few years and is considered as the fastest growing power markets amongst the Gulf Cooperation Council (GCC) countries. Accelerated socio-economic development coupled with expanding population, high rates of urbanization and substantial industrialization has led to the extensive utilization of its natural resources. Across the Middle East, the significant increase in demand for energy has doubled over the last decade and will continue to grow in leaps and bounds. In order to cater to this upsurge, it has become imperative to look beyond the existing resources and take credible measures that will reduce the impact of energy use on the environment, help conserve natural resources and boost efficiency. Qatar, on the other hand, being a natural gas rich country, with ample availability of solar power, has shown a distinct interest in harnessing alternative energy sources for the future. According to industry reports, Qatar has witnessed a significant increase in energy consumption per capita leading to an average annual growth of about 70% in power generation. Solar power offers tremendous benefits for Qatar in the form of minimal environmental impact, job creation and reduced greenhouse gas emissions, to name a few. The country’s renewable energy power potential is undoubtedly larger than its GCC counterparts. In line with Qatar’s National Vision 2030 to deliver a sustainable future, the government, is committed to attain 2 percent of the country’s energy from renewable sources by 2020. The country is focused on further developing its solar capacity through research centers, pilot projects and with the support of a number of organizations such as Qatar General Electricity & Water Corporation (Kahramaa), Qatar Foundation, Qatar National Food Security Programme (QNFSP) and Qatar Science and Technology Park (QSTP). Kahramaa has introduced innovative methods to accomplish their objective and to this end, they have undertaken steps to install solar panels on the rooftops of redundant surfaces such as water reservoirs and power stations, ensuring optimum utilization of the existing power transmission lines that will significantly reduce construction costs. Armed with a range of technical options to harness solar energy, the Qatar government has embarked upon a roadmap to develop a robust infrastructure for the deployment of smart grid solutions and applications that will distribute and regulate the flow of energy. As part of its Solar-Smart grid project, the country installed solar photovoltaic (PV) systems that are capable of producing 1.68MW of power, and also created its first Energy Monitoring Center (EMC) that is the focal point for managing the Smart-Grid and facilitating real-time administration of monitoring solar power. Smart grid is capable of improving reliability, reducing cost, and increasing efficiency. Energy efficiency is the decisive lever to raise the competitive edge both economically and ecologically day after day. 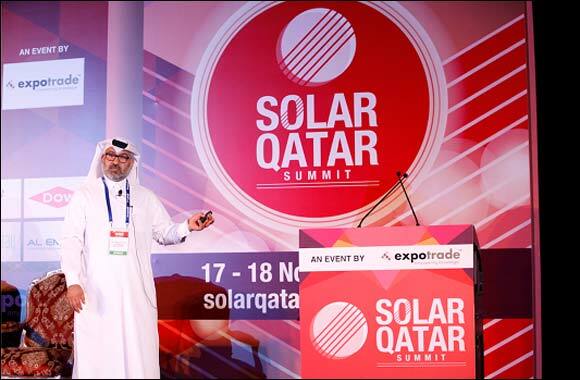 The success of renewable energy technologies and its implementation in Qatar will be discussed at the Power Qatar Summit, incorporating the annual Solar Qatar event on 26-27 October 2015 at Ritz Carlton, Doha, Qatar.